Rufita is a 12 month old female Cross-Breed. Beautiful little black and tan girl Rufita is an absolute darling youngster with a wiry soft coat. Rufita is a medium sized girl and she weighs about 10 kilos. She likes to play with other dogs and she has a loving character. She is an easy dog and will fit into most families. 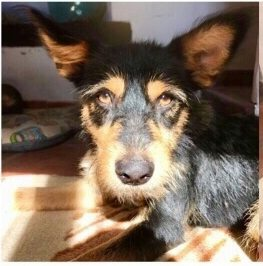 She was left on the streets of a Spanish town and she followed everyone in turn, trying to find someone to take her home. She would be fine as an only dog or with a companion. Fosterer’s report: She is currently in foster and fine with kids, dogs and cats. House trained, walks well on a lead and low energy for a young dog. She likes taking naps, playing with other dogs or humans and getting a cuddle. Current location is in a foster home in Spain can travel to the UK once she has a home to go to. 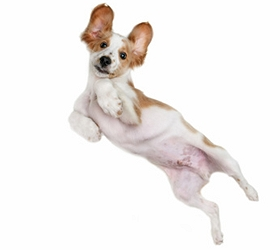 Vaccinated, wormed, flea treated, Spayed, Pet Passport, FREE 4 weeks Pet Insurance to be activated from the link on our website. Any known health issues NONE KNOWN. Adoption Fee : £ 110 plus transport costs – to be paid direct to the Spanish rescue to cover travel costs via UK bank account.